Timescape Psalm, the 2013 debut album from Daycones, was a decidedly strong first effort in its own right, the release's heady concoction of stoned surf guitar lines, leaden vocals and loopy atmospherics offering up a relatively unique take on well-trod psychedelic ground, but, just as importantly, it also showed potential for the future, leaving its many offbeat ideas, as impressive as they were, a lot of room to grow. 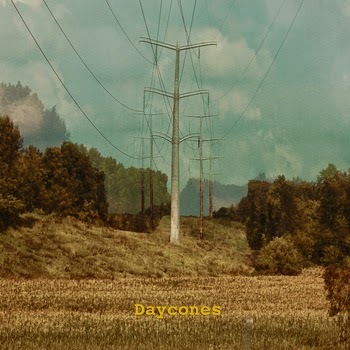 Of course, potential isn't always fulfilled, but Daycones' new The Cruel Echo easily improves on its predecessor, mostly by allowing those earlier flights of fancy to coalesce into something more solid. Now, that's not to say that fans of the first album's disjointed spaciness will be let down, after all the Arizona-by-way-of-Wisconsin solo artist also known as Ryan Janke did manage to establish an agreeably warm, spacious aesthetic right out of the gate, and was smart enough not to throw out the baby with the bath water, but here all the ethereal meanderings are bolstered with a newfound rhythmic backbone. Increased structure may seem like the antithesis of Daycones' dreamy, freewheeling approach, yet standout tracks such as "Millenials" and the lovelorn "Cult" actually benefit greatly from being a bit more grounded. However, while The Cruel Echo transitions towards a slightly more accessible, even conventional, psych rock sound, its sonic shifts are ultimately rather subtle, leaving Daycones, thankfully, still planted firmly in left field. The various quirks that made Janke's music so original and arresting in the first place remain intact, as evidenced by viscous, lysergic entries like "Memory Party" and "Illuminated", only now they have something substantial to play against, making their eccentricities even more enjoyable by contrast. In the end, the album is a worthy follow-up to Timescape Psalm, and an enticing look at what Daycones may evolve into next.